Ryanairdontcare Campaign have been passed information which relates to the charity scratch card which is sold on board each Ryanair flight for €2 each. Cabin crew are told to inform passengers that the 100% sale of this scratch card will go to charity which is a Lie....Ryanairdontcare Campaign have been informed that in 2011 €250,000 was given to charities from this charity scratch card by Ryanair..We may think this is very kind of Ryanair to do so much in helping charities or should we. Many corporations and big business have charity events or special promotions as a way of showing they care and support charities. Ryanairdontcare Campaign can confirm Ryanair's priority is to shareholders and on board sales of any kind are their priority and are big business. On average 15 scratch cards were sold on each Ryanair flight in 2011..With 1500 flights a day and an average of 540,000 scratch cards sold at €2 each,with an average revenue of €16.2 million - €250,000 given to charity plus prize money average of €250,000. 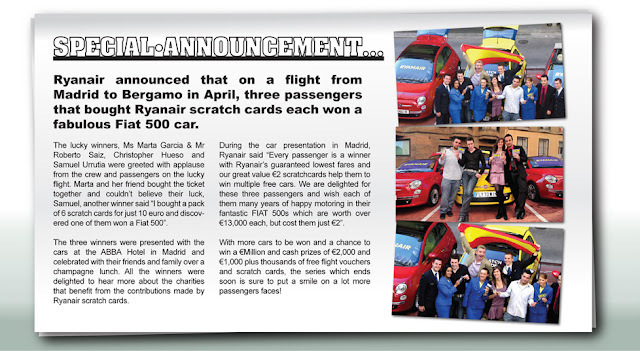 April 2011 was a very lucky month for Ryanair passengers when 3 passengers on the very same flight won a car..Each month 1 car is won on the Ryanair scratch card and Ryanair blamed Brandforce for a printing error..In May and June 2011 the months after the so called printing error sales of the charity Ryanair scratch card were 30% up on April sales............You Do Not Need To Be A Scientist To Work This CON Out. I can confirm why i know this information regarding Termination reference above...Many Terminated Ryanair cabin crew have informed Ryanairdontcare Campaign..
Nice post with great info. From where i can get the best Scratch Cards Printing machine? Very well said indeed. Yes the sales were up those years and in the follow years thank, to one special cabin Crew who was European top seller for all the four years she worked for Ryanair. This Girl made thousands of euro's one selling scratch cards never seeing before in the company. She was so hard working and committed to those awful abusers, and she kept selling every single day 100ds of scratch cards per days. She Has never being offered a contract or a supervisor position that she well deserved after 4 long years of hard work, excellent customer service, wonderful energy, innovative approach , fantastic and a strings of letters form passengers, supervisors and management, and O’Leary himself to acknowledge her as A great Cabin Crew and the Top European seller of all the time! She was earning less than 1000 Euros a Month and leaving at the edge of poverty while constantly smiling and looking happy and grateful to passengers and colleges....she was popular and everybody loved to work with her. A real special gem living in the muck!! She struggle with money to the point of not been able to buy proper quality food, going out with her friends or simply pay her bills and rent. The pressure was put on her so heavily to sell more and more every day!! Every single flight she was put in charge because she was selling 100 to 250 scratch cards a day....no flight was unsold!! She was incredible!! In her heart she hoped to achieve her dream of become number one (supervisor) to lead the cabin, to become an instructor and to earn finally good money she deserved. That never happened. She was promise that millions time but they were just lying to her. People with less experience who started to work after her where given contract and moved above her as supervisors. People who was not good at selling who were rude, who had no proper English or customer service training where given contract, money, and made managers! She was kept pushed to sell and sell with no glory or prizes with the seldom 10 euro perfume who smell like dog poo or the cream from L 'Oreal. She kept going until she breaks down in depression in two separate occasions. She was harassed on the phone , called at all the time, forced to give a date to come back, Scrammed at because she was not able to come back sooner due to her condition. She was then called on a meeting and bullied and screamed on and humiliated and told she was to be SACKED if she was not to come back - all for the purpose of selling scratch cards!! She returned to work and kept going. In April 2013 she finally made the decision that saved her life and health and left Ryanair. The day before leaving _ after giving a month notice - she was repeatedly called by management in an attempt to offer her “Something"...maybe a contract?? Same all, same all lies! She went and now she will live happy ever after while knowing that the Scratch cards are drastically dropped!! I hope people realise that Charity and this company are often scamming peoples together. And recently it has been proven.